The nice thing about moving from the frigid Midwest to the South is that you can gloat to all your family and friends back home about the weather when fall starts. “Oh, it snowed there today? That’s nice. It’s 70 here.” (Yes, I am a terrible person.) But a week or two ago, when I saw people posting pictures of the first snow of the year on Facebook, I felt a little bit jealous. Could it really be? Do I miss snow?! The last winter we spent in Wisconsin, I pretty much had a mental break over the weather. I worked on the University of Wisconsin campus and I took the bus to work, which meant that I had to walk several blocks to my building everyday in the wee early hours of the morning. And those wee early hours were cold! The wind and the snow and the sub-zero temperatures would make my face ache and by the time I got to the office, my toes would always be numb no matter how many pairs of socks I layered on. I was done! Done with winter! But now I feel a little nostalgic for it. Maybe not for the cold weather itself, but for looking out the window and watching the snow fall. And for that feeling of relief that hits you when you enter a warm building after being out in the cold. And for hot stews and curries on cold winter nights! On the worst of the winter days, I’d get home from work, put on my pajamas, and throw together a quick pot of soup or curry. I guess it’s that cozy, bundled up feeling that I miss. 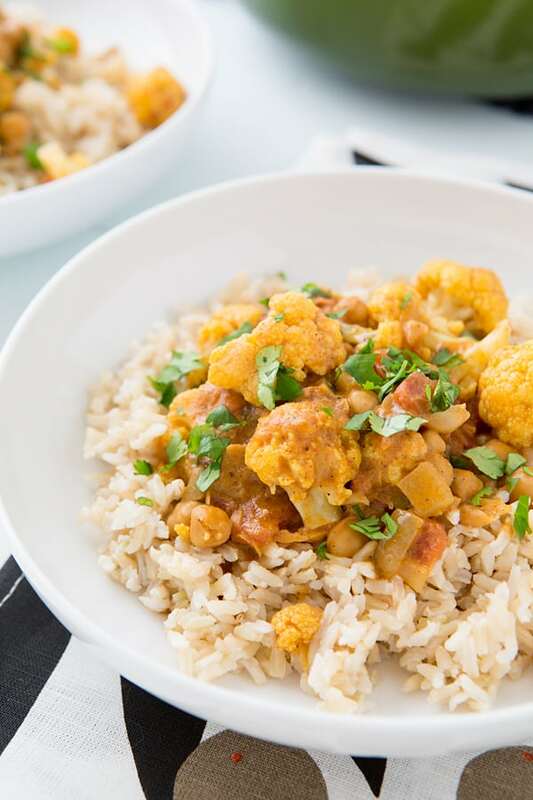 So I tried to remedy that with this Cauliflower and Chickpea Coconut Curry. This is one of those recipes that I never needed a recipe for. Sometimes I’d make it with chickpeas only, other times I’d put different vegetables in it. It’s easy like that. It’s not a spicy curry and the creamy coconut sauce makes it perfect for serving over rice or with a side of naan. This curry is a heaping pot of winter comfort food—even if your winters involve sunny 60 degree days. 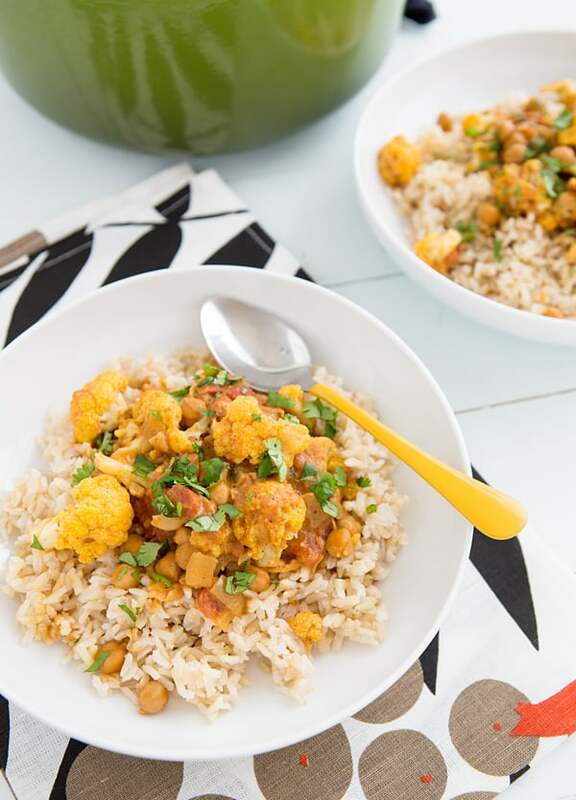 An easy coconut curry made with chickpeas and cauliflower. Heat the coconut oil in a large Dutch oven over medium heat. Add the onion, garlic, and ginger and cook until softened, 5-7 minutes. Stir in the spices and cook until they’re fragrant, about 1 minute. Add the chickpeas, tomatoes, coconut milk, and cauliflower. Increase the heat to medium-high and bring to a boil, then reduce heat to low, cover, and simmer for 15 minutes. Uncover and cook 5 minutes more, or until sauce has thickened slightly. Season with salt and pepper to taste and garnish each serving with cilantro.